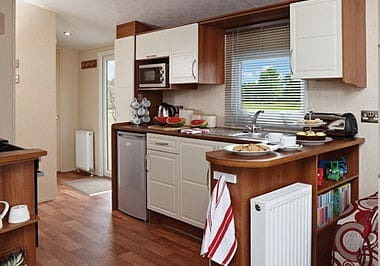 Newly available at Tayport Links Caravan park on a brand-new pitch with it’s own back garden and parking space, this Rio Gold luxury holiday home has been thoughtfully designed to maximise the feeling of space and light. 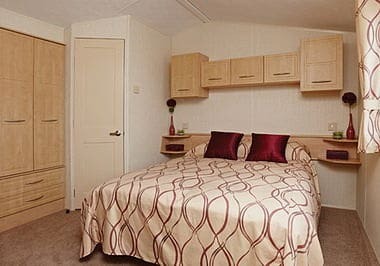 Complete with central heating and double glazing it benefits from sprung lounge seating and a large fixed dinette area which have all helped to make this one of our best selling caravans over the last few years. A spacious and functional kitchen benefits from light cupboards and drawers, ‘Rum granite’ effect worktops and laminate style vinyl flooring. 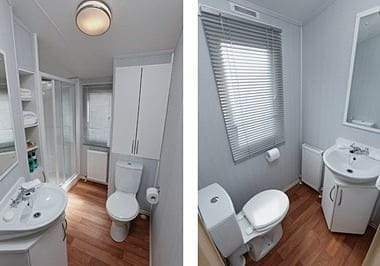 The spacious main bedroom of this two bedroom model is a real focal point, as not only does it provide a fantastic space, it also features an en-suite WC, a feature more akin with much more expensive models. These surprisingly spacious models include generously proportioned rooms, plentiful storage space, contemporary upholstery and soft furnishings.